Well, I started this month off really spiritual, telling God, “I’m sick of giving things up.” Yep. Let’s be honest. I was beginning month 3 of 7, and felt like this would be one of the “easier” months….coming off of fasting from excessive food and clothes….but when it really came down to it, I still had to give something up. And I just wasn’t that excited about it. It’s not in our human nature to want to give things up. And so this month again felt very much like practicing the very thing I want to get better at, but I have to choose with my will to do: denying self, in order to experience more of Jesus. This month, that meant giving up music. I was amazed at how long it took before my hand didn’t automatically reach to turn on the radio in my car. It’s so engrained in me. I think we don’t realize how many habits we have until we try to change them. Practically speaking it was a month that was much quieter than usual. I noticed the silence mostly in the car and when I was doing my hair. I tried to be intentional about replacing the quiet with prayer…which proved to be more difficult than expected. I listened to some podcasts on prayer that were very insightful. Sometimes it was nice to just be quiet and give my busy life a rest…..although my mind is always going so that can be difficult for me as well. I wanted to have an epiphany to share. I wanted to hear from God this month, and have a crazy story about what He said to me. But sometimes it’s just about the every day; day to day moments, living life with Him. Right now I’m at a place in my life where I feel so close to Him, surrendered, and free. Whether that’s from coming off a month of practicing quiet, coming off an Easter weekend where I’ve meditated on the cross, or just a result of where He has brought me and what He’s doing, I don’t know. But I’ll receive it. And quietly wait to hear more of His voice. I wore the same dull gray dress for 28 days straight, and not one person, who wasn’t already aware of this month’s fast, noticed. And even some people who knew about one dress February, forgot until it came up in conversation! I think as a woman especially, I spend a lot of time each day deciding how to adorn myself with just the right outfit and accessories, because I think the whole world is walking around thinking about me, or at least noticing what I look like when I breeze past them. There are times when I become obsessed with how others are viewing me. That obsession, combined with comparison, produces my self conscientiousness. After a month of one dress, it’s almost laughable that I would let how others view me, control the way I view myself. We humans are plagued with the sin of thinking more about ourselves then anyone else. And then we let our minds become contorted and distracted by that sin and self consciousness is birthed. One dress February is breaking me free from self consciousness and the traps that come with it. A friend once told me “I want to wake up each morning, and dress for me.” And that’s what I will be embracing too. Within appropriate reason and modesty of course, I will choose my outfit based on what I would like to wear, not what I think others would like me to wear. 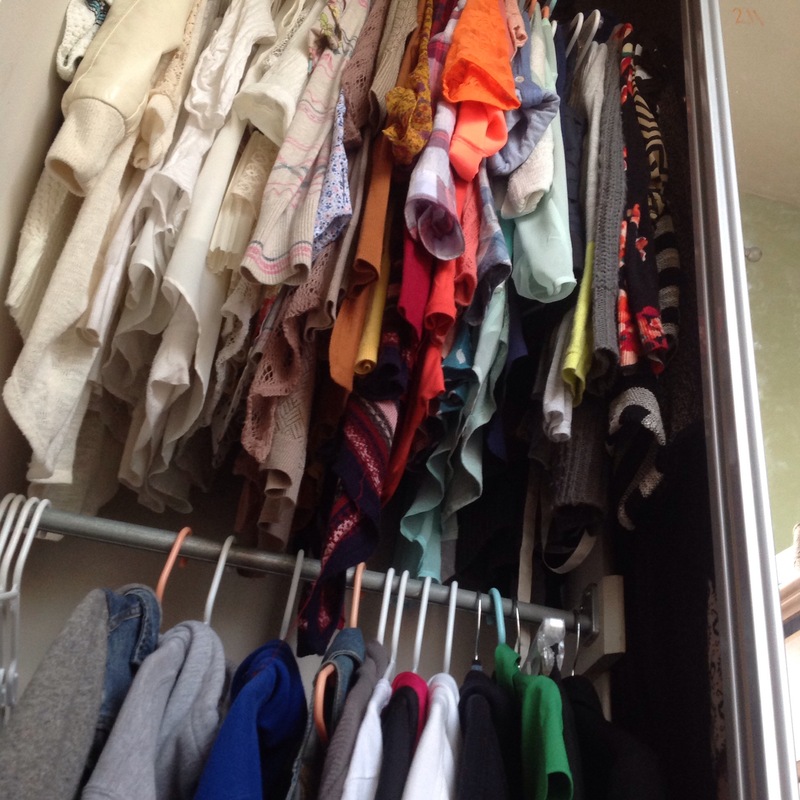 Aside from those realizations, it got me thinking….if people aren’t that concerned with what I’m wearing, is it necessary for me to have this many clothes? How much money do I spend on clothes that I don’t truly need? Don’t get me wrong, I still looooooove clothes. I love how choosing an outfit each day is like making a piece of art. It’s a way to express creativity and to feel outwardly beautiful as I pull on a pair of jeans that make me feel confident. But what I’m talking about is the fact that I have an exorbitant amount of clothes hanging in my closet. 128 articles to be precise. And that’s not including my piles of shoes, boxes of accessories, two baskets full of laundry, and 3, yes I said 3 dressers brimming with more clothes, or the bins I keep in the basement with my spring/summer clothes! And then it gets me is thinking about my kiddo Albert who lives in Mukono Africa who maybe has two or three changes of clothes….the homeless who I have no idea how, survived this bitter cold winter. There are many many people who has significantly less that I do, and yet I li my “American Dream,” lifestyle of comfort. I think small changes can make a big difference. And that’s what I intend to do. God has started with my heart, and He is working His way to my actions and choices. What if when Jesus called us to die to ourselves, He really meant it? What if He really wants us to live a life where we give, not only our things, but our lives away? And not just for the sake of giving life away, but to invest in the work of Jesus; work that makes an eternal difference. Could something as small as one less shirt a month do just that? A journey of less, in order to experience more of Jesus. Join me? Well…it was harder than I thought it would be. When I committed to eating 7 foods for the month of January, I thought maybe by the end of the month it would be really hard and I would start to really get sick of my seven foods. But it ended up being quite the opposite. When reality hit, the first few days were so hard. I made several discoveries…. First, I hate plain food. Hate it. I hardly ever eat food that has no sauce or seasoning in it. So although I had thought I could be creative and mix and match my 7 foods, at the end of the day……..I was still eating the same 7 foods. And they don’t taste very different when they are plain. I tried being creative with the way I cooked things, but ended up having some pretty bad stomach problems. Blaahhhh. So after about a week and a half I got into a routine and ate the same thing for breakfast (eggs with rice mixed in), lunch (cold chicken, apples, and almonds), and dinner (chicken, rice, and tomato bowl with a side of green beans). This worked for me because by the time I got to dinner each night, it had been 24 hours since I’d eaten tomatoes so I was excited about tomatoes again….that is, as excited as you can be when you’re eating the same 7 foods for a month. Me: Do you think children who are starving even have taste preferences? Like do they even like or dislike foods? Or are they just hungry? Lindsay: I think they’re just hungry. That’s so sad. I’ve never experienced eating for this purpose only. And yet, there are children all over the world who experience this every day of their lives, and may not even get to satisfy their hunger the way I did every day. And here I am, I get to see food as a form of entertainment for my taste buds. I didn’t realize how many times a day I get to make a choice. I am able to choose what I want an incredibly large number of times a day, simply in the food choices I make. And I don’t notice it. Until I give up that “right” or should I say, privilege. I had borrowed the Hunger Games movies from a friend and frequently watched them the past couple months. I think they’re ingenious. It’s a futuristic movie where 12 districts of people are starving, and then there’s the Capital, which houses wealthy people who have outrageous luxuries. The districts apart from the capital have to send two tributes from their district to an “arena” to fight to the death while the world, and especially the people from the Capital, watch on television. Sort of like Gladiator meets reality TV game shows. Wow. I couldn’t argue with her. I don’t know how other countries view us, but I wouldn’t doubt that we seem that way. When I watch The Hunger Games I am so judgmental of the people from the Capital. Then I dump out water on a daily basis because I poured too much in my cup, while there are communities dying because they don’t have fresh water. I throw away food because I’m full or don’t like the way something turned out, and there are children eating scraps out of dumpsters they’re so hungry. And it’s not just in other countries…it’s here too. In my country, in my neighborhood. This month I was reminded of a commercial I saw years ago that broke my heart. It showed a mom taking a bunch of ketchup packets from a fast food restaurant, and then putting it all in a pot, adding water, and cooking it over the stove to make tomato soup. When she tried to feed it to her kids, they were so sad and didn’t like it…but they was all she had to give them. And I struggled to be thankful and satisfied with seven foods to eat each day. Extremely humbling. And then there’s the other aspect….it’s so easy to feel convicted about something, create this extravagant plan, post it on your blog, and get ready to start these big commitments….then you begin……..and then it gets hard. Really hard. And everyone around you is eating catered Piada for your teacher in-service, or cupcakes for helping your friend move, or you walk into someone’s house that smells like garlic and roasted onions…..and all you want to do is throw away your almonds and apples and eat a big piece of lasagna. I was definitely reminded of how hard it can be to stick to a commitment. I can feel very convicted about something, but then when it comes down to actually doing it, it’s hard. When it comes to denying myself of the “rights” I think I have or deserve, it’s challenging. It’s extremely hard to break away from a life of entitlement. I thank God for awesome friends who cook seven foods for me and find creative things like rice cakes, and dried green beans and gift to me. I thank God for encouraging texts from my council of girls, and for an understanding family who let me eat at home instead of spending time with them at a restaurant watching them eat food I’m not allowed to have. And most of all, I’m thankful for grace. God gives me so much grace as I struggle with feelings of entitlement on a moment by moment basis. Lord, continue to open my eyes to see life in all its reality. Empty me of my selfishness and pride. Make me aware of how many millions of moments I should be walking in thankfulness. And grant me opportunities to be generous with the bounty you’ve given me. Day 1 and I panicked. I discovered that as wonderful as I think guacamole is, however good a dish mixed with avocado is, and however much my mind wants to love avocado, I don’t like it plain. Hate it in fact. And whether my queasiness that day was due to the chocolate withdrawal or eating plain avocado, I will never know. But I panicked. 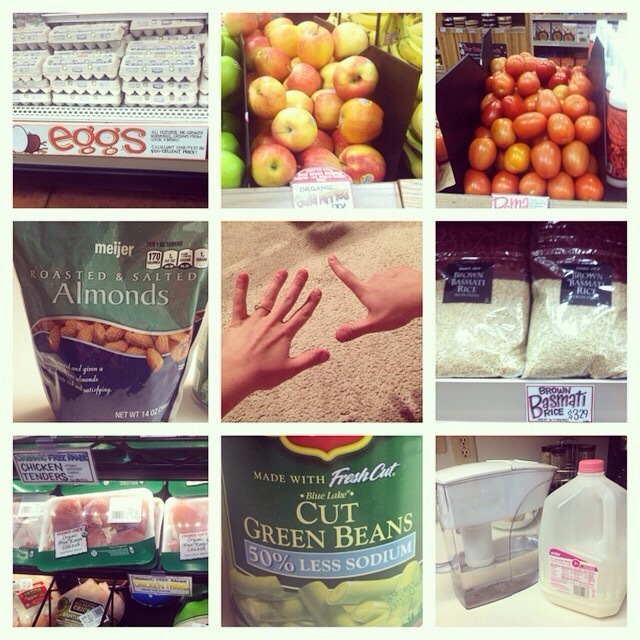 Tracie: Day 1- I’m willing to let you change to a different food so you can survive the month. Angie: Total permission. 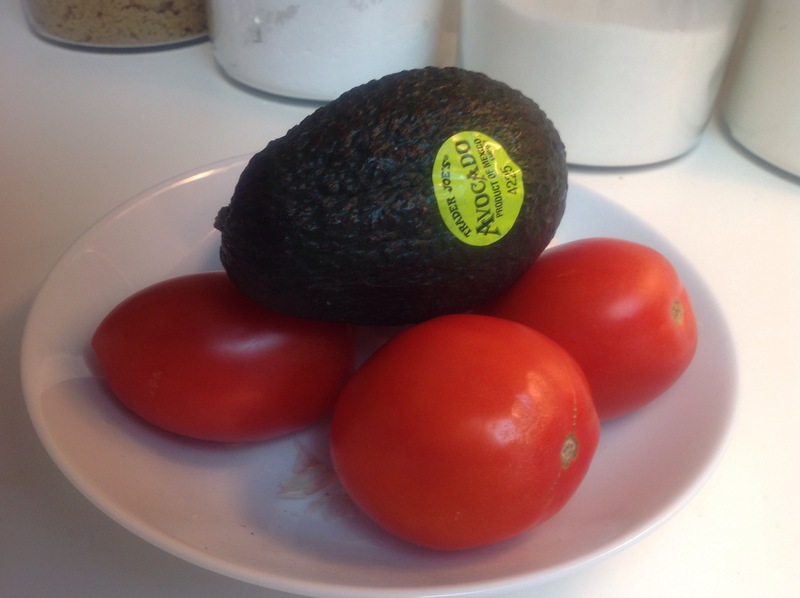 Avocados are like eating baby poop. Tracie: What?! I eat them with a spoon. So good. Erin: What is the new replacement item going to be? I vote for cheese. Ha. Couldn’t live without them. So what is my pick? After one meal I officially changed my food item choice of avocado to almonds. Reasoning? I need something else to eat on the go. And a different texture. Or my teeth will forget how to chew something crunchy. So long avocados!! Neither my tastebuds, nor my stomach, will miss you. Maybe I will continue to try and like you when I’m not eating plain 7 foods. Lindsay: Who picks a nut over cheese?? My life is full of stuff. FULL. Overflowing. I have a bedroom busting with things, my clothes barely fit in my closet and drawers…actually I will tell on myself and admit that I have several bins designated as the “switch out bins” for when I switch my summer and winter clothes because not all of my clothes fit in my closet and….yes….three dressers. Right next to my clothes bins are several other bins with…who knows what….just “stuff.” I secretly think my roommates must take my name in vain every time they go to do their laundry in our basement and have to maneuver around all my storage. Love them. They put up with me and all my stuff. I also live an extremely comfortable life. I eat what I want, when I want to, and if I’m not eating what I want, it’s because I’m too lazy to go get what I want! Because I have the luxury of being lazy. And I have a car that will take me wherever I want to go. I have the world at my fingertips with my iPhone…no matter how slow or cracked it may be…..ha. 🙂 My mind is filled with noise….never a dull moment as I listen to pandora, i-tunes, the radio, CD’s…yes I’m still a CD user sometimes. I run, run, run, and do as many fun things as I can pack into every moment of every day of my life. I am currently sitting on my comfortable couch, listening to the wind howling outside my door, wrapped in a warm blanket, fresh from a hot shower, reading a great book. Enter Jen Hatmaker’s book 7: an experimental mutiny against excess. Talk about eye opening. I mentioned in my last post how I was shocked to learn that not only am I rich, but based on my annual salary, I’m in the top 4% of the wealthiest people in the world. That number often sticks in the front of my mind these days. In fact just today I was explaining this recent discovery to my fifth grade students who seemed just as shocked as I was. Jen became overwhelmed by the excess of stuff and what it does to us. How it shapes us and makes us more self-centered and entitled than we already are. How it feeds so many of our sin areas and does not create in us a heart like Jesus. I’m embarking on a journey of less. It’s time to purge the junk and pare down to whatever is necessary, what is noble. 7 will be an exercise in simplicity with one goal: to create space for God’s kingdom to break through. I love that. As soon as I started reading it…I knew I had to participate. I must take action when I’m learning something. (Yes I was that kid in school who always shot my hand up to be the volunteer.) I need to do things. Experience them. And I’ve felt the Lord walking me in this direction for awhile now. If you’ve been with me over the past year there have been many lessons learned……My eyes have been opening to blessings, spiritual and physical. My heart has been challenged to practice thankfulness in order to find true, deep, joy…challenged to obedience and submitting my whole self to Jesus and what He wants from me….deepened my vision of loss as true gain in order to share with Christ and experience all that He chose to let go of…learned how to fall at the feet of Jesus in utter and desperate need of Him. an intentional reduction, a deliberate abstinence to summon God’s movement in my life. A fast creates margin for God to move. Temporarily changing our routine of comfort jars us off high center. A fast is not necessarily something we offer to God, but it assists us in offering ourselves. I need help in offering myself. I’m terrified. Scared. Think that I’m probably as crazy as Jen Hatmaker. And I think the only reason I will make it through some of these months is pure stubbornness….and the grace of God. I’m excited. Stoked actually. I love a challenge…competitive in nature. I love the idea of simplicity and the purging of junk. I am excited because I know God will move. I know He will do more than I could ever imagine. I need Him to teach me more. I’m hungry for Him. If this physical exercise will help me become more aware of my blessing and more aware of my need for Him…then so be it. Bring it on.